ICE for Jan. thru March 2019. Please come and see the Display at the library. Carol Brooks Named new President of the Prospect Historical Society. Click here for more information! 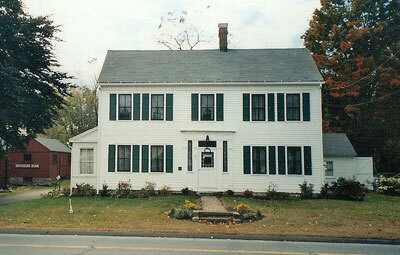 The Hotchkiss House in Prospect Connecticut was owned by the Hotchkiss family for over 160 years, housing three generations of the family before becoming the headquarters of The Prospect Historical Society. 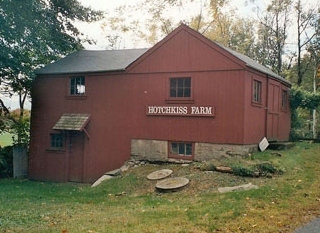 The original structure of the farmhouse was built by Frederick Hotchkiss for his son, David Miles Hotchkiss, in 1819. During his lifetime, David Miles Hotchkiss, a town selectman and abolitionist, conducted lessons for a boarding school, The Select Academy, in one of the upstairs rooms of the house. David Miles's tenth child, David Bryant Hotchkiss, inherited the home from his father upon his death in 1878. Three of David Bryant's children, his son, Treat, and two of his daughters, Ruth and Mabel, never married and resided in the house for the entirety of their lives. Click here for the membership form. Please print it out and send it in with your check($15.00 for an individual or $25.00 for family) made out to the Prospect Historical Society. All the information that you need is on the application! The Prospect Historical Society is proud to offer the 2018 Nellie and Ruth Cowdell Scholarship to a graduating senior from Prospect. Please download the application below, fill out the application, assemble the necessary paperwork and forward your application package to the address listed on the application. Thank you for all your hard work during your high school career. Good luck with the scholarship. Anthony M. Mulhall was selected as the recipient of the 2018 Nellie and Ruth Cowdell Scholarship awarded by the Prospect Historical Society. He was honored at a reception in July. Mulhall will be attending University of Connecticut in Storrs with a major in engineering. He is a graduate of Sacred Heart High School in Waterbury, where he was on the honor society, student council, and received an Outstanding Community Service Award for his many volunteer hours. The Prospect Historical Society is now on Facebook! Click below and check out our page! After you look around, make some comments and like us so that we can keep you updated on our upcoming events! Treat, Ruth, and Mabel were the last of the Hotchkiss family to live in the house, and are well-remembered by long-time Prospect residents. After their deaths, the house was left to their nieces, Prospect residents Ruth and Nellie Cowdell. The Cowdell sisters sold the house and the surrounding property to the town of Prospect in 1980 and upon their deaths, the town received a bequest from the sisters for the upkeep of the house. The house was entered into the National Register of Historic Places in 1982. Open from 9am to Noon every Thursday!